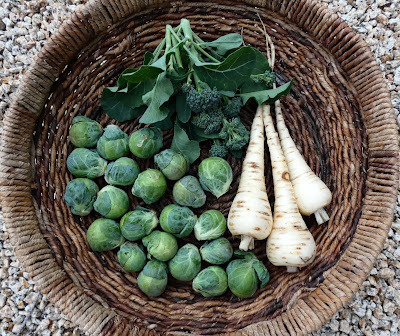 We had some very nice weather last week which allowed me to get some work done in the garden and I managed a few harvests. But the last few days have been very wet and at times very windy so work and harvests have stopped for a few days. More rain is on the way though so I doubt that I'll get much done in the garden this week. The most notable harvest was the Amsterdam Prickly Seeded spinach. It was starting to bolt so I cut it all and netted about 3/4 pound of leaves. That was enough to make a gratin that also included ricotta, feta, and eggs. The Brussels sprouts are finally starting to size up. The broccoli shoots keep shrinking. And the parsnips are holding well. I removed the rat protection from around the broccoli as part of my garden cleanup which left the plants exposed for a few nights and miracle of miracles the broccoli was not munched. Perhaps the rodents are hibernating. Also harvested was one more head of Queen of Crunch lettuce which escaped the camera. Harvest Monday is hosted by Dave on his blog Our Happy Acres. 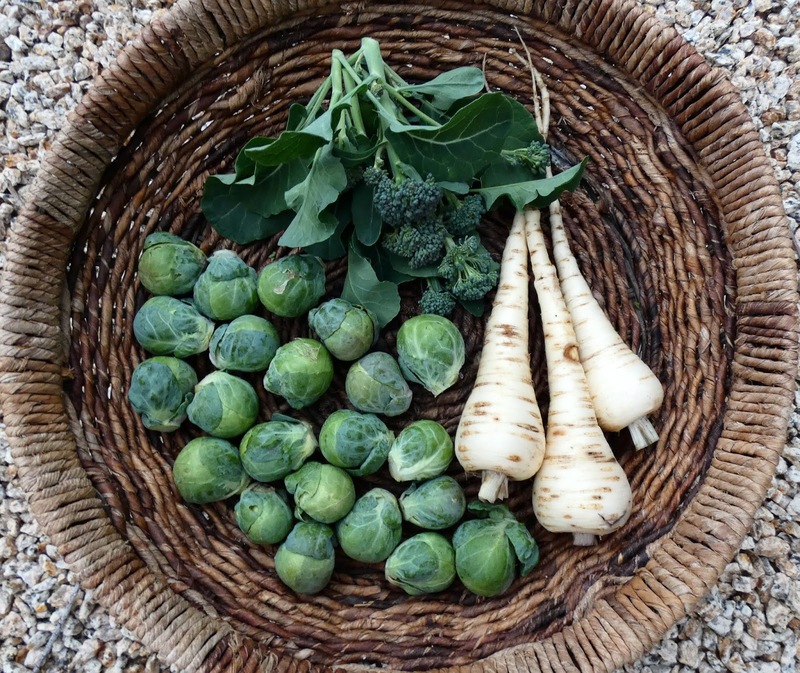 Head on over there to see what other garden bloggers have been harvesting lately. Maybe the rodents got drowned in their burrows with all the rain? Tee-hee. We got 3.8 inches in the pst week. Yay! 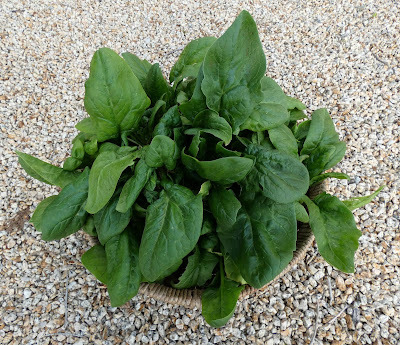 When I grew the Amsterdam spinach a few years back it was one of the most flavorful varieties I had ever grown. I used to overwinter spinach in the greenhouse but now I grow kale, which gives me more from a limited space. I do miss the homegrown spinach though. Always hate to see the broccoli side shoots shrink. I waver in deciding when to yank the plants. Even the little guys are useful. Usually depends on whether I have something waiting to go in. Happy day on the rodent front! Hurray for a rodent break! Lovely spinach! I've not grown it for a couple of years due to it's finnickiness but I'm sure I'll give it another go at some point. We had a very cold week last week so no gardening or harvesting were done. This week is supposed to be going to ‘warm’ up. Warm as in relative temperatures rather than really ‘properly’ warm. We have had non stop rain today. I've never grown Amsterdam spinach and may consider it if I remember. I think the reason I don't grow spinach is because its easy to buy. I have never known the real parsnip here. I have no idea the taste or how to cook that.